When it comes to summer in New York, what's the point of drinking at a bar if it's not afloat? 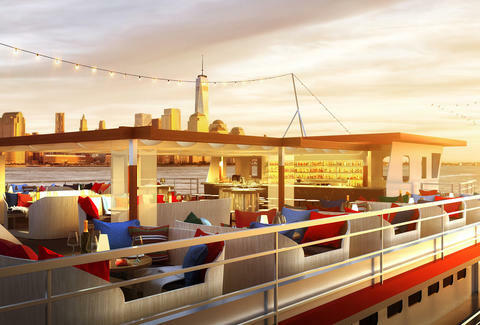 Shed your cold-weather clothes, forget that you suffer from mild seasickness, and get ready to soak up that Hudson River-reflected sunshine while eating lobster rolls and drinking booze, because there’s a brand new fish bar opening on the water. Fish Bar at North River Landing, the new sister restaurant to North River Lobster Company, is classing up the waterfront with a three-story seafood lounge and restaurant at Pier 81 on West 41st St, opening May 1st. Housed on a 10,000sqft yacht, Fish Bar features a roof-level patio and a bi-level dining area with both outdoor and indoor bars. There will also be plenty of banquettes, nautical accents, and semi-private outdoor cabins. On the booze front, you’re looking at farm-to-table cocktails that use herbs grown in the North River Landing rooftop garden. Over 20 craft beers and Champagne varieties will be offered as well, in addition to a wine program led by an in-house sommelier. As for the food, you can look forward to lobster rolls, Plymouth Rock oysters, and black truffle burrata. Hurry your Sperry-clad feet down to the docks at Pier 81 starting May 1st. Rides will be offered several times a day, so you have plenty of opportunities to get after it all. Sarah Anderson is the Senior Production Assistant at Thrillist and can maybe miss Rhode Island summers slightly less now. Find her on the boat and @smileforsarah and @sarah_jfa.